Spring in the mid-west region of the U.S is the most welcome season. It is enjoyed the most with the beauty of colorful blooming tulips and lilies all around. 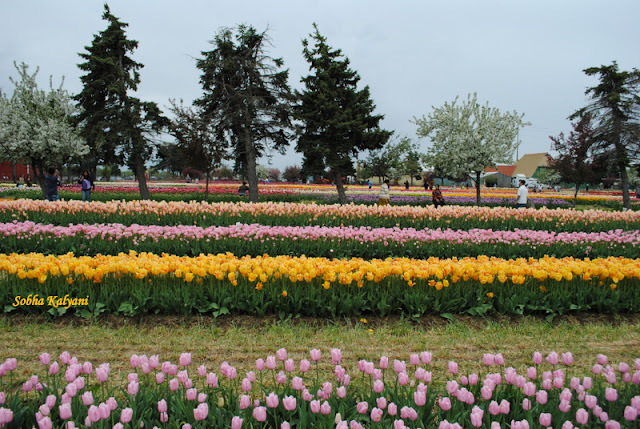 It is the best time to go on a trip for the beautiful tulip farm in Holland in May. 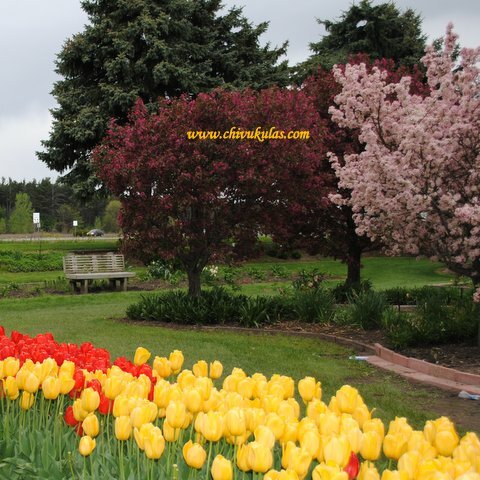 Holland is a cool town in Michigan state and is visited by tourists in May to see the beauty of tulips in Veldheer Tulip Garden which is located at 12755 Quincy Street in Holland, Mi. On stepping into the garden, there is a vast stretch of fields with colorful rows of tulips and lilies which takes the visitors into a beautiful world. For Indians who visit this place, it might instantly remind them of the old Hindi classic melody 'Dekha ek khwab to ye silsile hue, door tak nigahon mein hai gul khile hue', pictured on Big B Amitabh Bachchan and beautiful Rekha in the classic movie Silsila. And for Telugu people, the sight of tulip fields will remind them of the old hit song 'kotha kothaga unnadi, swargamikkade annadi' pictured on Venkatesh and Tabu in Coolie No.1. 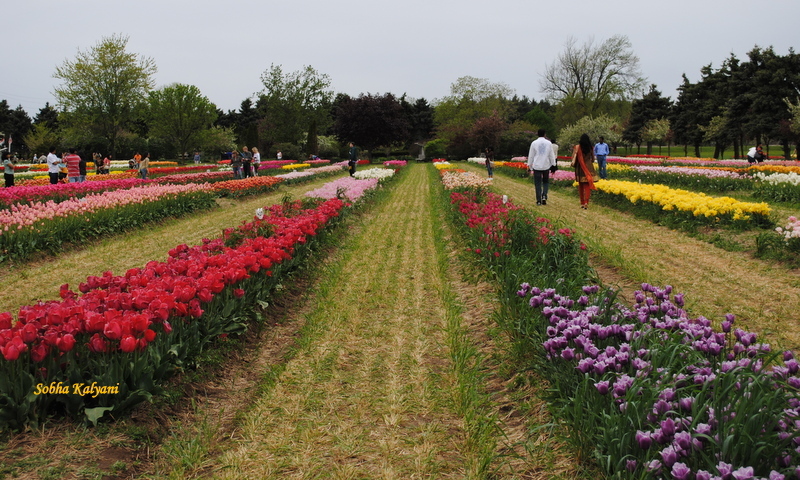 Keeping the filmy part aside, tourists / visitors are sure to forget the world behind them and their day-to-day problems on entering into this beautiful Veldheer Tulip Garden when in full bloom. The cool weather even in the month May, the beautiful colorful blooms literally take the spectators to a different world. There is a water-wheel and a wind mill at the entrance of the farm and a wooden shoe factory inside. On entering inside the farm, viewers will be awestruck on seeing the beautiful and colorful stretch of tulips and lilies. The beauty of varieties of fully bloomed colorful tulips is a real treat to the eyes. The stretch of colorful bands of tulips in the field reminds one of the tulip farms of Amsterdam in Holland. This is undoubtedly one of the best places to visit for Indians. One can see many Indians with their friends and family walking in the fields and taking clicks at different spots. A majority of Indians are sure like this place. Newly married couples will enjoy the most and will be literally lost in their own dream world at this beautiful place. Every year Tulip Festival is hosted in Holland in 1st / 2nd week of May. It's quite cool at this place in May, yet the weather is pleasant with colorful tulips all around. Holland is a cool and clean city located on the Eastern shore of Lake Michigan. Besides Veldheer's Garden, tourists can go to Tulip festival which attracts a large crowd, spend the whole day in the festival, enjoy the typical Dutch culture with lots of Dutch attractions in the festival. 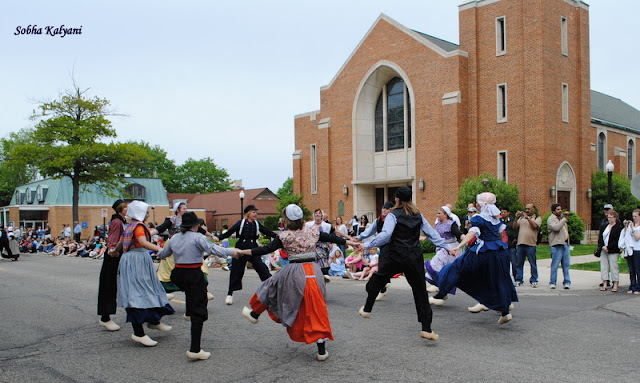 Above all, the wonderful traditional Dutch Tap Dance with the rhythmic beat of the wooden shoes made by the dancers on the road, is a must-watch event. The festival and the dance are enjoyable and worth watching. There are number of rows of stalls in the festival where you can do lots of shopping to get the traditional Holland stuff. However, Indians and South Indians in particular need to compromise with the food at this place. It would be a wonderful and memorable experience driving all the way to Holland from other places in the mid-west.